Chef Andrea Froncillo learned to cook from his nonna in Italy. 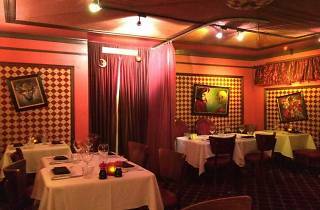 At Bobo’s he melds those Italian roots with Asian influences. 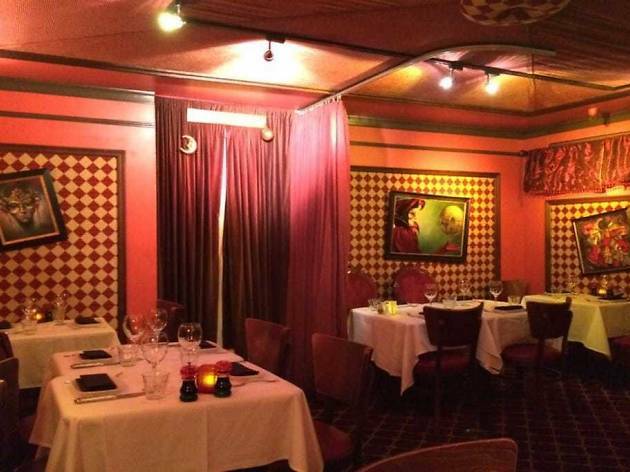 The steakhouse has a Venetian feel, with red banquettes, stained glass light fixtures, festive art, and checkerboard walls. The beef is aged four to six weeks, pan-seared with garlic and rosemary, and de-glazed, resulting in a juicy, tender steak without unnecessary frills. The cuts range from an 8-ounce petit filet mignon to an enormous 49-ounce porterhouse ($150). The latter is separated into its parts—a New York steak and filet mignon—and cooked separately to achieve ideal doneness for each. They’re served together on one plate. Wash it all down with a basil martini or two.